Radial aircraft engines have been droning through the skies since the dawn of powered flight. Despite new technologies that eclipse their early designs, they continue to serve. Two of these engines in particular stand out as milestone motors, forever ensconced in the history of aviation. In the pre-dawn of July 25, 1909 Louis Blériot readied his fragile monoplane for flight, and after adjusting his helmet and goggles, he tied his crutches to the fuselage, necessary after recent flying misadventures. His mechanic pulled the prop through and the fragile three-cylinder Anzani engine sputtered to life. A small dog barking angrily ran into the whirling six-foot propeller and was killed instantly. Many witnesses felt this to be a bad omen for the precarious flight. Before his final takeoff roll, the engine was liberally doused with castor oil and his mechanic reminded him to manually pump every three minutes to maintain the pressure. With 17 litres of fuel on board and no navigational instruments he was airborne at 4:41 a.m., just as the sun was breaking the horizon. Alessandro Anzani was a former Italian bicycle racer who manufactured twin cylinder motorcycles before venturing into aircraft engines. His three-cylinder experimental model in the Blériot monoplane was prone to overheating. Its 206 cubic inches produced 24.5 horsepower at 1600 rpm. Part of the overheating problem was due to the fact that only the top part of the cylinders had cooling fins, and this very nearly ended Mr. Bleriot’s record-breaking flight. Fortunately, a cooling rain shower saved him from a wet uncertain fate. The 22-mile trip from Calais to Dover was successfully completed in 38 minutes. Many joke that this was the longest any Anzani three-cylinder engine has ever run without catastrophic failure. However in reality, it was considered a state-of-the art engine at the time, and with continuous improvements, remained popular with light aircraft for another 20 years. To put this flight in perspective, it must be remembered that it took place a mere five years after the Wright brothers first coaxed a heavier than air machine skyward for that infamous short hop at Kitty Hawk. Fast forward another 18 years to May 1927 when still another young man decided to tempt fate by crossing a slightly larger body of water. Charles Lindbergh chose his aircraft and engine combination carefully. The Ryan NYP (New York – Paris) was purposely designed for the trans-Atlantic crossing and the engine was a Wright Whirlwind J5 radial. The Whirlwind was an evolutionary engine. Charles L. Lawrance built his first decent aircraft engine as a three-cylinder radial producing approximately 60 hp. His next development took nine of these same cylinder assemblies and arranged them on a common crankcase to produce the J1 in 1921, a 180-hp radial that would eventually evolve into the Wright Whirlwind. A merger between Wright and Lawrance produced needed capital to hire more engineers. Samuel D. Heron was at the absolute forefront of air-cooled cylinder design when he was brought on board to improve the efficiency of the J1. His new cylinder head improved breathing and cooling, subsequently boosting overall power, and the J5 Whirlwind was born. At the time it was considered to be the most powerful and reliable radial engine that money could buy. Mr. Lindbergh had seen the 220-hp engine perform in the Bellanca Columbia, an aircraft specifically designed to showcase the new engine, and that combination was his initial choice for the Atlantic crossing. The owner of the Bellanca, Charles Levine, refused to sell the aircraft, causing Lindbergh to seek out the fledgling Ryan Company to build a plane to his specifications. However, there was never any doubt about which engine would pull “The Spirit of St. Louis” aloft, and it was subsequently designed around the venerable Whirlwind J5. The early J5s of that era were designed with rocker arms that required greasing at regular flight intervals. A close inspection of photographs taken of the engine installed in the Ryan NYP reveals one of Lindbergh’s necessary modifications. The rocker arm covers have white cylindrical objects attached to their exterior. These were specially designed spring-loaded grease reservoirs for feeding lubrication throughout the long flight. Subsequent models of the J5 eventually incorporated pressure-lubricated rocker arms. After 33.5 cold, lonely hours Lindbergh’s wheels touched down in France on May 21, 1927. That successful flight proved to be of huge significance in the popularity and further development of all radial engines. During the golden age of the piston aircraft, nearly every major manufacturer produced varied models of this tried and true engine design. Its excellent power-to-weight ratio and small crankshaft still lend itself to certain areas of aviation that require quick throttle response and compact simplicity. It often remains the piston engine of choice with crop dusters and floatplane operators worldwide for those same inherent qualities. 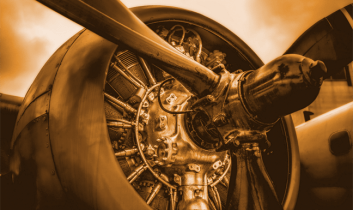 They may be greasy, leaky, and bordering on environmental incorrectness with their billowing blue smoke on start-up and raucous racket on takeoff, but like the pioneers that chose them, radial engines have earned our respect for their ability to perform. It is a wonderful thing to realize that in our microchip, touchscreen, throwaway world, old round engines can still occasionally rule the sky!